These Sriracha Garlic Toasts with Shrimp are super fun to serve as an appetizer or with a lunch salad! It took me a little longer than most to fully grasp the sriracha craze. I can be cautious like that, most definitely a product of my parents. I’m not saying that’s a bad thing. Really. Because the older I get, the more I appreciate their steadfast non-reckless approach to life and all its curve balls. But my sisters and I do like to razz Dad and Mom about some of their cautiousness and resistance to change. For instance…we were the last family in the county to own a microwave. And the last family in the nation to play a video game on our own tv in our very own living room. Strong statistics, I know. But that was my viewpoint when I was young. To their credit, though, I think I was the first kid in my class to hop on an airplane to visit Mickey Mouse at Magic Kingdom. And that experience rivaled all. I was the happiest kid in the world. It doesn’t take a whole lot to make me happy when it comes to food. And right now, sriracha and shrimp are helping to keep me smiling in the kitchen. It all started with creamy sriracha shrimp cups. And ever since then, I’ve been dreaming up new ways to enjoy that awesome combination of flavors. 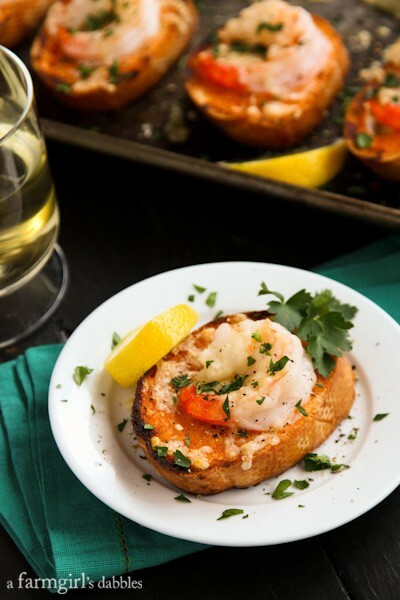 These Sriracha Garlic Toasts with Shrimp are beautiful and tasty, with a side of daring. And I have no doubt that my parents would approve. I created this recipe for Land O’Lakes as part of their Kitchen Conversations group. I especially liked how easy it was to whip up the creamy sriracha garlic butter spread for the toasts, using Land O Lakes® Butter with Canola Oil. All it takes for this tub to soften is just a few minutes out of the refrigerator, and then it’s perfectly creamy and spreadable, ready to schmear across anything you desire. In my recipe, I simply stir together Butter with Canola Oil, sriracha sauce, and fresh minced garlic to create a flavorful spread for the toasts. It’s just too easy! 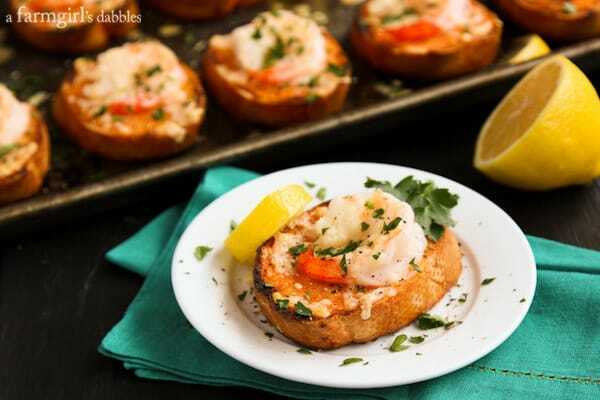 These Sriracha Garlic Toasts with Shrimp make for an eye-catching and super delicious appetizer or side, perfect for gathering your friends and family together for a meal. 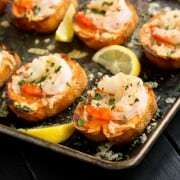 The toasts are pillowy soft on the inside, lightly crisp and toasty from the broiler on the outside. And the flavor is incredible, packed with the kick of sriracha and garlic, and the irresistible sweetness of shrimp. A good meal is something that most of us take for granted, though. We forget how many families are going hungry. Every single day. In our very community. Our family has donated cans of soup for our church’s soup drive and grocery store gift cards for those in need of a proper Thanksgiving meal, and we’ve dropped off grocery sacks of non-perishables at the emergency food shelf. This past weekend, I helped prepare and serve a meal to families experiencing homelessness at a nearby Family Service Center. It’s all around us. Families are in need of a good meal. And that’s why this post is being dedicated to feeding America. Land O’Lakes has partnered with Feeding America® to kick off their second year of the Pin a Meal, Give a Meal campaign. For every Land O’Lakes recipe that is pinned or re-pinned between now and May 31, 2014, the Land O’Lakes Foundation will donate $1 to Feeding America. By pinning my Sriracha Garlic Toasts with Shrimp (please pin the first photo in this post), you will contribute 9 meals to Feeding America. And to contribute even more meals, simply pin additional recipes from Land O’Lakes here. 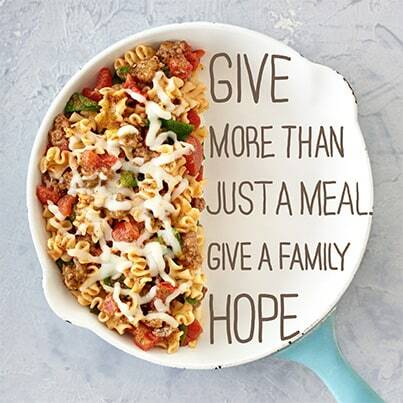 Use the hashtag #giveameal on Pinterest and other social media to help spread awareness, to help us give families hope and reach our goal to donate 2.7 million meals! 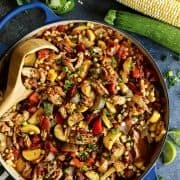 Pinning is easy, and a great way to create a collection of simple, delicious meal recipes for your family. If you don’t already have a Pinterest account, you can create one here for free. 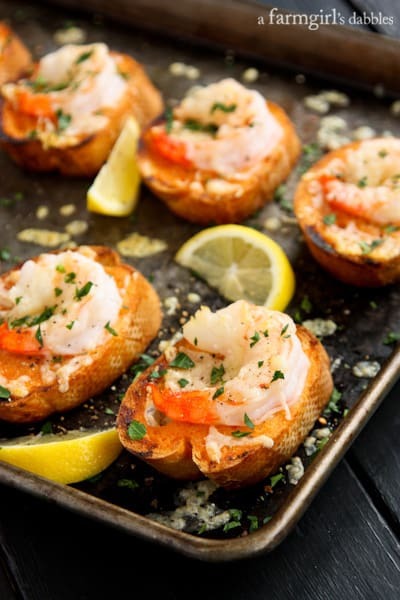 Then take a moment to pin my Sriracha Garlic Toasts with Shrimp, plus a few other tasty recipes found on the Pin a Meal, Give a Meal Pinterest board. It took me about two minutes to re-pin 10 Land O’Lakes recipes. Not only have I helped others, but I’ve also given myself some easy recipe inspiration for future meals. I call that a win-win. Rinse the shrimp and then place them on a paper towel-lined plate to dry. Press another paper towel lightly onto the top to remove excess moisture. Set aside. 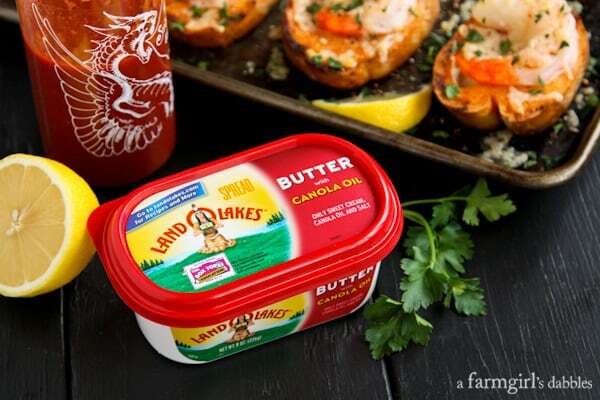 In a small bowl, combine 4 ounces (just eye up half of the tub, there’s no need to measure it out) of the Land O Lakes® Butter with Canola Oil, sriracha, and garlic. Mix until thoroughly combined. Depending on the sriracha you use and your preference for it, you may want to use less or more. Adjust accordingly. Spread both sides of each of the bread slices with the sriracha garlic butter. It may seem like alot, but use it all. It makes for luxuriously buttery toasts! Place bread slices on a large roasting pan and broil one side only, until bread is toasted. Remove pan from oven and turn each slice of bread over, so that the toasted side is on the bottom. Place the remaining tablespoon of Land O Lakes® Butter with Canola Oil onto a dinner plate, and microwave for a few seconds to melt. Add the shrimp and toss to evenly coat. 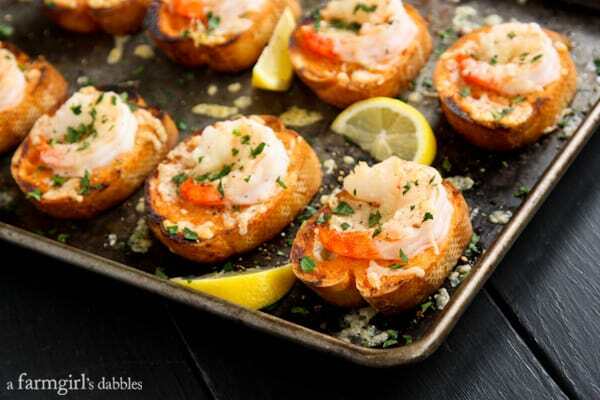 Place one shrimp onto each bread slice. Sprinkle with fresh Parmesan and freshly ground black pepper. Place toasts under the broiler again, and cook until bread is toasted and the cheese is melted. Remove from oven and let sit a couple minutes before serving. Sprinkle with parsley and serve with fresh lemon wedges for squeezing over the top. Pin a Meal, Give a Meal here! Disclosure: a farmgirl’s dabbles has partnered with Land O’Lakes for an exclusive endorsement of Land O Lakes® Butter for their Kitchen Conversations blogger program. Thank you to Land O’Lakes for sponsoring this post. All opinions are my own. I always love shrimp and sriracha! These are perfect for entertaining! Love this campaign, such a great cause! This looks great! I love the use of Sriracha with anything…love the added flavor. Thanks for sharing! This is gorgeous and sriracha…I have been obsessed with it lately!! I need these little spicy bites in my life. I totally understand; it took me a long time to get into browned butter. This recipe looks delicious! Killer recipe, and doesn’t Sriracha make the world go around! I love that the shrimp are served on the buttered toast. I imagine this as a great appetizer or a light lunch. BRENDA!!! Oh my gosh! I’m in love with these! Oh my gosh these looks amazing, I could eat an entire batch myself! Thank you for this recipe I cannot wait to try it! I want to make these and every single one! These are def addictive. Blake and I did a great job polishing these off all by ourselves! Wow pretty impressive the feeding program with Lands o Lake. I loved your sharing of your growing up situation. Until recently I didn’t even know what srirach was. So I didn’t know there was even a band wagon to jump on. More importantly I love this charming quick appetizer recipe. Great for a crowd and great for me who lives alone. Thanks, Carol – so nice to hear from you! God Bless you and Land O Lakes for feeding Americans who are in need of meals! I don’t think we do enough for our own families who are in need. What a great recipe Brenda. I also recently jumped on the sriracha band wagon recently and love it! I think our house was the last on the street to get cable tv! 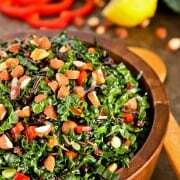 Nice recipe and love this program! Thanks, Maria. I’m loving this program, too! PINNED! I Love Land 0′ Lakes and this program! Now I just need a plate of these toasts and my day will be set! Thank you so much for sharing, Laurie. And let me know if you make these toasts! The recipe AND the program sound fabulous! Thanks, Christine. The toasts are scrumptious. And the program is awesome! I want a plate for lunch! delish! 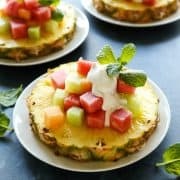 Pinned and hello what an awesome appetizer! I love the program that Land O’ Lakes is running here and I LOVE these toasts! It’s an all around win! Hi Rebecca! Thanks on the toasts. And, yes, honored to be involved in this program. Thank you SO MUCH for all your sharing with this program and recipe, Alice. It’s very appreciated. It was awesome to meet you, too!! This is such a delicious recipe and you know I will be pinning it everywhere! Such a great recipe Brenda!! Off to pin! Are you kidding me? I want this for breakfast!!! This makes an awesome breakfast, just fry up an egg! :) Thanks, Liz!